The partially eclipsed “Blood Moon” on 8 Oct 2014. This was shot near the end of the eclipse, when the moon finally became visible. After having two Supermoons elude me this year, I can’t wait to capture the total lunar eclipse earlier tonight. Also called the “blood moon” due to its reddish colour during totality, the maximum eclipse is set to occur at 6:55pm Singapore Time, shortly after moonrise. Unfortunately, just like last year’s Supermoon, our Indonesian farmers are clearing forests by burning again, causing our skies to be very hazy. I waited out at the rooftop of my office, hoping to catch a glimpse of the “blood moon” but it eluded me yet again. It looks like this year’s lunar events are all very camera shy. I packed up, resigned to my fate that I’ll not ever see it and went for dinner with my colleagues. Lo and behold, it finally showed up while we were cruising along the Ayer Rajah Expressway. As I left the tripod at the office, thinking that I’ll not see the moon, I need another way to stabilise the camera. So after parking at the dinner location, I propped my Nikon V1 and 70-200mm f/4G VR on its hood on the roof of a pickup truck and took a few shots with the Nikon ML-L3 IR remote, one of which the one above. Other than basic exposure, contrast, noise reduction and cropping, no other processing is done. 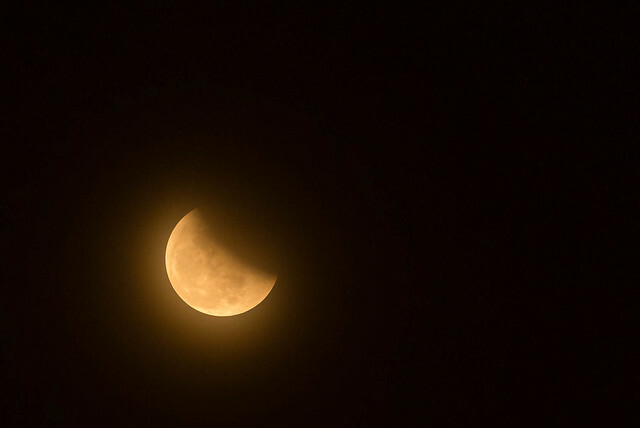 The haze has also contributed to the orangey colour of the moon, although it has passed the “blood moon” stage. By this time, I can no longer have any usable foreground interest, but hey, it’s better than nothing right? The next blood moon will be on 4 Apr 2015. Hopefully I’ll have better luck then. This entry was posted in Photography and tagged blood moon, lunar eclipse, moon, Singapore. Bookmark the permalink.